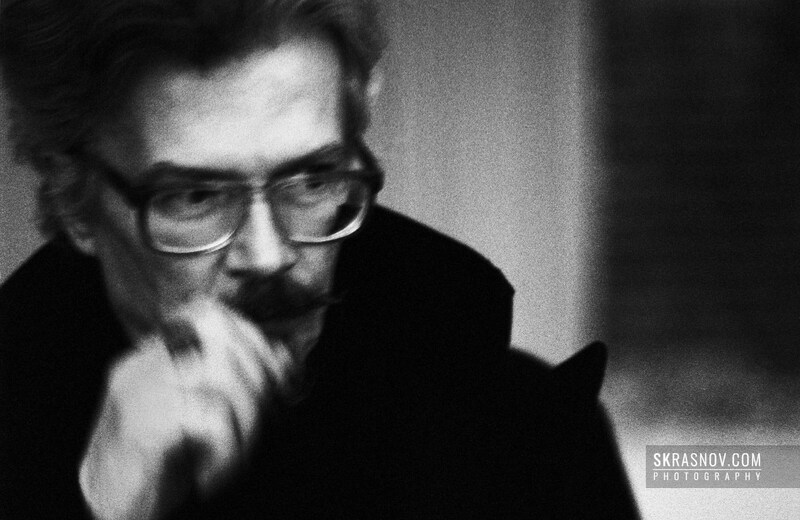 Eduard Limonov is a famous Russian writer, poet and political dissident. He is a very controversial and meticulously researched figure — and I don’t think I have much to add to what has already been said about him. Once I was invited to a very strange exhibition, which took place in a no less unusual place — a former huge gas holder on the territory of a Moscow gas plant, built in the second half of the 19th century. The plant has long been turned into an office and art space. The gallery occupied an entire floor; it was a vast circular space, a labyrinth of partition-walls between which visitors bustled in and out. Eduard Limonov ran past me as quick as lightning, and I only managed to figure out who he was. He stopped to say hello to someone, and I managed to take 2-3 shots. It was dark, and the camera I had with me was loaded with a Fujichrome 64T tungsten film. I decided to use a cross-process for its developing. Typically, this kind of processing increases film speed by +2EV. Thus, it gave me a 200 ISO film. But the exposure was still long, and the photos turned out to be blurry, and to my surprise, it conveyed the very feeling when Eduard Limonov sped past me.